If you were the victim of a crime at a Florida ATM and suffered a serious injury, then you should speak with the ATM crime victim attorneys at the Wolfson Law Firm. We will never charge you for our initial consultation. We have helped injury victims in Florida for more than 50 years and we are standing by to answer your questions. Just reach out to us at (305) 285-1115 for your completely free consultation. Automated teller machines, better known as ATMs or cash machines, allow customers of financial institutions perform various money transactions, such as money withdrawals, deposits, money transfers, or simply obtaining information about one’s bank account. ATMs are always installed in the most convenient locations. Most often, it is inside or just outside banks, but you can find them everywhere where you would like to withdraw money for spending - inside or next to malls, stores, gas stations, airports, metro stations, railway stations, bus stations, restaurants, and even cruise ships. There are over 3.5 million cash machines installed worldwide, but their use is declining. In many places, mostly in the western world, less and less people use cash, so they don’t need to withdraw or deposit funds regularly. Florida ATMs are regulated by Chapter 655 of the Florida Statutes. Since everything about ATMs is money-related and thief-inviting, one of its sections provides important rules about ATM security. According to Florida Statute 655.962, the ATM operator is obliged to provide adequate lighting during hours of darkness. The cash machine, as well as parking, access and exterior areas are also required to provide proper lighting. The statute sets forth specific rules for lighting and the areas surrounding the ATM. The same section provides two more duties for ATM operators. They must provide rear view mirrors or surface areas to allow you watch your back while performing financial transactions. The last one is to ensure that the height of any landscaping, vegetation, or other physical obstructions in the area required to be lighted as mentioned above. Your Florida ATM crime victim lawyer can evaluate the facts of your loss and compare with the statutory requirements to help you understand if the bank, ATM owner or landowner may be legally responsible for your harms and losses. These laws provide some security for ATM users. Proper lighting, rear view mirrors and proper landscape should discourage thieves, and therefore reduce the risk of violent attacks to some point. Unfortunately, as with anything related to money, ATMs and people who use them are common targets of criminals. Those who want your money are ready to go far to get it. In many cases, criminals use advanced methods, such as card trapping and card skimming, which is stealing essential electronic data from your card and making it readily available to criminal elements. There are criminals who are not so sophisticated, though. They just rob ATM users by using violence and life threats. These attacks don’t go always as planned for them, as many people resent the attack and opt to defend themselves. During such acts of bravery, however, victims sometimes end up with personal injuries, sometimes even with death. But our Florida ATM crime victim attorneys remind everyone that life is much more important than cash or property. Better to live another day and your loved ones would agree. Florida ATM criminal victim attorneys have, unfortunately, seen many cases of violent crimes leading to personal injuries and wrongful deaths at ATMs. Assailants realize that people with bank cards standing next to an ATM have money, and don’t hesitate to take their shot. They willingly involve themselves in stabbings, shootings, and physical torture. Sometimes even rapes and sexual assaults at ATMs occur, with or without robberies due to dangerous conditions. The victim or victim’s family has the right to recover damages from the criminal offender once convicted, but that might not be the only liable person. The bank, ATM owner and the landowner where the cash machine is installed could also be legally responsible for paying for your damages, injuries and losses. Banks, ATM owners and landowners where the ATM is located could be held legally responsible under Florida laws. Crime victims can seek damages recovery from them, but they must consider many circumstances in mind before claiming for damages. If the cash machine is located at bank premises, there will be little doubt that the bank is liable for any personal injuries that occurred during a crime at their own machines. As with any other commercial entities, banks owe a duty of care to their invitees while on their premises, including people who need an ATM. If the ATM is located somewhere else, such as a mall or a gas station, the landowner where the machine is installed is obliged to secure it under Florida law. Like banks, they are obliged to provide a safe environment for their clients. That means securing ATM well so that it reduces the potential of a potential assailant deciding to rob someone, or worse. 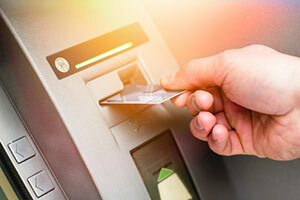 When banks, ATM owners and landowners breach their duty of care due to negligence, and that allows the assailant to easily reach the victim, they can be liable for damages. They can be required to pay for your medical expenses, non-medical expenses, lost wages, physical and mental stress, as well as pain and suffering. This list is not exhaustive. If you wonder if your ATM personal injury in Florida has been caused partially by bank or landowner negligence, you should discuss that with the best Florida ATM crime and injury lawyer you can identify. Only after you speak with a top ATM crime victim lawyer can you decide on the right course to follow on your journey to recovery and justice. At the Wolfson Law Firm, we have helped victims of negligence, intentional acts as well as victims of crime since 1963. We are here to help you too. We offer free consultations and never charge a fee unless we make a financial recovery for you. Our Florida crime victim and wrongful death attorneys. Have also assisted the survivors of those killed by negligent, intentional or criminal acts. Call us today and let’s discuss your situation. We will listen to you and investigate the facts of your loss. Then we can provide you with your legal options to go forward at no cost. Call us now at (305) 285-1115 or toll-free (855) 982-2067 and speak with our bilingual crime victim injury team. Our Florida crime victim lawyers are available to assist anyone in Florida who was injured in any type of incident including ATM crimes. We offer our services throughout Florida including Miami-Dade County, Broward County, Monroe County, Palm Beach County as well as Miami, Key West, Fort Lauderdale, West Palm Beach, Naples, Fort Myers, Sarasota, Clearwater, Tampa, Orlando, Tallahassee, Gainesville, Jacksonville, Daytona Beach, St. Augustine and Melbourne.